This is Hawkeye, my first trainee guide dog puppy. He was offered to me when I was a volunteer puppy-raiser, after he had made an “escape bid” from the Guide Dog Association’s kennels where he was born. It was such a drama that the fire brigade had to be called, resulting in a news article in The Sunday Age newspaper, below. He was a precious little pup who worked very hard towards his goal of becoming a working guide dog but unfortunately that was not to be. More of his story to come. This strip is part of the series Photobooth 41 Year Project. You can see all the posts that document the series by clicking here. 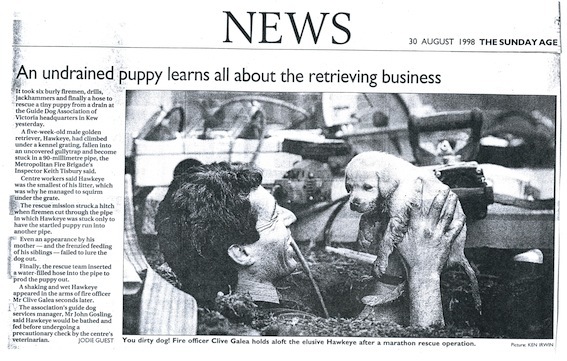 The newspaper article from August 1998. The original photo from the news article. An unpublished photo of the escape drama. Thanks. He was such a sweetie. I still love him. What a beautiful dog that is. Sounds like he may have been too spirited? I’ll look forward to the continuing story. Great strip of photos! Thanks Mike. Shouldn’t bee too long before the next pics of him come up. A dog in the photobooth. I should have guessed pets would be showing up! Seems there might be a story in how you came by the original photos from the news story. The best thing about a guide dog puppy is that one doesn’t have to smuggle one into the shopping centre to get the photos. 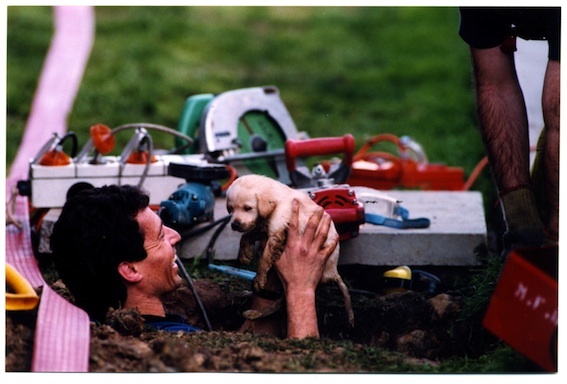 They have a right to be there even when tiny pups-in-training. It is more difficult with my current pooch, a dingo-labrador cross, who is neither small enough to fit in a handbag or under a blanket, nor obedient enough to respond to the command “duck!” if a security guard is wandering too close for comfort. I have nevertheless got him into booths on two or three occasions and also smuggled in his best friend, a beagle. No story to the original pics from the news article. They were ordered from the newspaper publications dept. once I knew Hawkeye was going to be mine for 12 months. Those are nice shots as well, which I missed before. That is enough of a story about the newspaper pictures – fits totally with what I would expect. Being a person that would never get around to ordering a shot from a newspaper, I am impressed by those that do. Is it still something that can be done I wonder? I guess so, but then again maybe they don’t have the money to manage a department like that. Maybe they just send out digital files for a fee? Oh that is just too gorgeous! What a lovely thing to do. Thanks. Thanks Sue. It was a fabulous feeling being involved with these amazing animals and the amazing people who trained me and the “grown up” dogs. Very, very cute! He was my first puppy and I loved him so much! Thank you. I have another strip with this dog coming up soon. cutest puppy ever! can’t wait to hear the rest~he is very loveable! I miss being a puppy raiser. It is such fun having babies on a frequent basis and not so hard to give them back as I expected it to be.